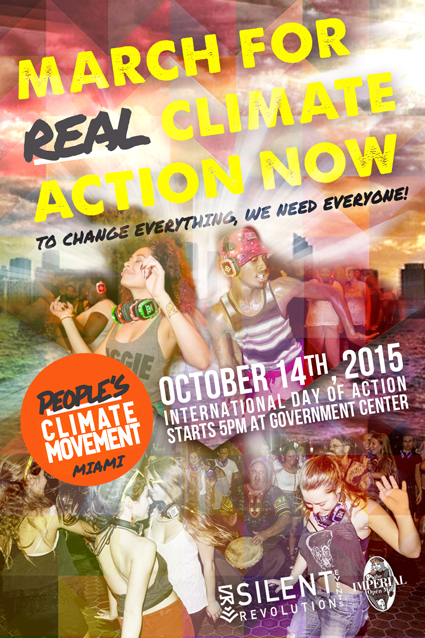 A collaboration with the organizing committee that became the Miami Climate Alliance, representing over 80 local organizing partners for a local Day-of-Action following up the previous years People’s Climate March in NYC, the largest climate march in history, attracting an estimated 400,000 people. The branding campaign for the local march featured an ominous looking skyline of downtown Miami with a grid-pattern overlay creating a future-apocalyptic feel of a drowned Miami with bold distressed text making clear it’s demand for real climate action. The campaign also included a unique collaboration with Silent Revolution, highlighting the march’s focus on bringing in the arts and including performance dance to help tell the narrative. The march intended to raise awareness of the variety of threats to the region posed by climate change, and also serve as a call-to-action to demand greater attention and investment by city officials. From humble beginnings as a guerilla marketing campaign, Miami’s march went on to become the largest march in the country that day, attracting an estimated 1,200 participants. In response to the citizen lobbying efforts, the County allocated in its budget the creation of a chief resilience officer position, and agreed to fund engineering studies.